With a call to merge “the forces for good and profit,” the Hult Prize targets a major global challenge each year and solicits entrepreneurship ideas from the world’s university students. After regional finals and incubator training for the top teams, the winning business idea will receive a $1 million grand prize. The University of Wisconsin-Madison student team headed to the Hult Prize in Sao Paulo, Brazil include (from left) Bimpe Olaniyan, a senior in mechanical engineering; Cedric Kovacs-Johnson, a senior in chemical engineering; Eric Ronning, a senior in mechanical engineering; and Jon Seaton, a graduate student in medical physics. Team members are employed at the Morgridge Institute for Research Advanced Fabrication Laboratory. Four UW-Madison students who work together at the Morgridge Institute for Research Advanced Fabrication Laboratory decided to answer the call. 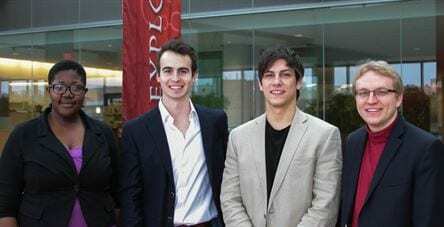 Their extensive blend of past experience in entrepreneurship and international service earned them a trip to the regional competition in Sao Paulo, Brazil, on March 7-8. Out of more than 10,000 applicants, about 300 teams are invited to regionals held in San Francisco, Dubai, London, Boston, Shanghai and Sao Paulo. A single winner from each regional will be invited to the Hult Prize “Accelerator,” a technology-based business incubator, over the summer. According to the Hult Foundation, nearly two out of every three deaths worldwide are the result of NCDs, the most common being heart disease, stroke, diabetes and cancer. The vast majority of these diseases can be prevented or treated, but the lack of adequate health care or preventive health information makes NCDs especially lethal among the world’s urban poor. Olaniyan is a first-generation American, from Nigeria, who has travelled twice to Lagos, the largest city in Nigeria with 17 million people and dramatic problems with slums and poverty. She also served on an Engineers Without Borders service team to Haiti, where she helped build an irrigation canal that provided key water access to a rural community. Each team member has some unique background relevant to the Hult challenge. All four collaborate in the Morgridge Fabrication Lab and will likely use the lab for prototype development. Cedric Kovacs-Johnson, a senior in chemical engineering, traveled to the Congo and conducted research on Congolese infrastructure. Eric Ronning, a mechanical engineering senior, started the company Re LLC to develop his invention of a more affordable and functional prosthetic hand, which can be made available to Third World markets via 3D printing technology. And Jon Seaton, a graduate student in medical physics, is part of a team that won the UW-Madison Dvorak Energy Prize in 2013 for a device that converts laptop computer heat into battery power. The team was picked based on its relevant experience and strategy for choosing an impactful business. Now, they are researching some of the systemic problems of healthcare in urban slums, such as a lack of transportation and the high cost of drugs. One element of their business plan will address increasing awareness of the health options people may not know they have. The Hult Prize, sponsored by the Hult International Business School, is designed to promote savvy, for-profit companies that will represent the non-governmental organization (NGO) of the future. The prize wants to produce businesses that address some of the world’s larger social problems, but do so with a sound business model and profit motive. One of its leading partners is former President Bill Clinton and his organization, the Clinton Global Initiative. The team hopes to raise money to cover the approximately $12,000 in expenses for the trip to Sao Paulo. If you would like to help the team, or learn more about their ongoing project, please contact the team at uwhultprize@gmail.com. The group is on Facebook and Twitter at @UWHultPrize.